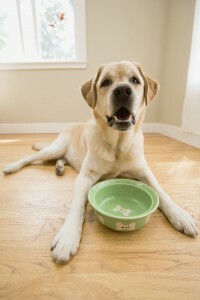 Choosing a good kibble for your dog doesn’t always seem easy. The labels on the packages appear designed to confuse, and beyond identifying whether a food is chicken or lamb-based, people often come away feeling they need a science degree to decipher the rest. And while an ingredient may sound good and conjure up images of plump juicy meat parts, you need to be aware that the definition of what constitutes that ingredient (if it even has a definition) can be quite different. Well, we can’t change the labeling laws here – but we can give you an overview of what we think you should be looking for in a good quality dry dog food. First and foremost, dogs are carnivore/omnivores – a good proportion of their diet needs to be meat protein sources. Plant proteins tend to be more difficult for dogs to digest, are less palatable and offer less nutrition. Grains are lower than vegetables on the digestibility and nutritional adequacy scale. So, look at the top five or so ingredients – these form the major portion of the food. The ingredients in dog food are required to be listed in order of weight. So that means that the first ingredient on the list is the one with the greatest volume in the food. We want this to be a named meat source – eg. Chicken, beef or lamb. Never unidentified “meat” and never a “by-product”. Note also that since the list runs in order of weight, it is better to see “chicken meal” than “chicken” at the top of the list. “Chicken” includes a high degree of water content, “chicken meal” does not – so with “chicken” it is quite possible that once the water content is removed, it may actually be the fourth or fifth ingredient, not necessarily the first as suggested. Within the first five ingredients we want to see at least two (preferably more) named meat sources, and as few grains as possible. The first ingredient should certainly be a named meat source. Grains are almost unavoidable in kibble, but they are not a natural source of food for dogs, are often undigestible (what’s the point of a food if your dog can’t digest it?) and are common allergens. Whole ground grains are far better than grain fragments (floor sweepings?) which typically have little or no nutritional value. Brown rice (a whole grain) is better than white rice, which has been stripped of about 75% of its nutritional value. Whole fruits and vegetables are better nutritional sources than grains. Looking further down the list, we prefer not to see any corn products in the food (corn, corn meal, corn gluten meal, corn syrup, etc) as corn is very difficult to digest, of little nutritional value, and a very common allergen for dogs. Same goes for wheat products/fragments and for beet pulp or molasses (sugar). It should go without saying that we would never buy a food with any form of corn or wheat in the top five ingredients. We do not want to see any by-products in the food, especially of un-specified source. The AAFCO definition of “chicken by-products” for example is “ground, rendered, clean parts of the carcass of slaughtered chicken, such as necks, feet, undeveloped eggs and intestines, exclusive of feathers, except in such amounts as might occur unavoidable in good processing practice.” Now some of that stuff is OK – nothing wrong with chicken necks. But it is impossible to ascertain the quality and most of the ‘good stuff’ such as hearts, livers, and kidneys don’t go into by-products, they are useful elsewhere, unless the quality is too low. By-products are really those parts that can’t be used anywhere else and a lot of it isn’t OK. Without any ability to determine quality, we prefer to avoid by-products. Do not forget to look at the preservatives used. Some of these are carcinogenics. Some common cacinogenic preservatives to look for and avoid are: BHT, ethoxyquin, BHA and propylene glycol (a less toxic form of anti-freeze). Citric acid as a preservative can also be problematic as it dramatically increases the risk of bloat if the food is moistened before feeding (according to veterinary research). In our opinion, it is better to purchase a food using tocopherols, ascorbic acid (Vitamin E) or anti-oxidants such as rosemary extract. Better yet, purchase a food that doesn’t contain preservatives at all (there are a few). We do not want to see any artificial colors, flavors or sweeteners added to the food. “Splitting” This is where the manufacturer “splits” the total amount of an ingredient into component parts to make it appear as though there is a lesser amount of the ingredient. An example would be an ingredient list that read like “chicken meal, ground corn, brown rice, corn gluten meal, lamb meal…”. Looks OK – the top ingredient is chicken meal. But is it really? Well, probably not. The manufacturer has “split” the corn content into component parts of ‘ground corn’ and ‘corn gluten meal’. As a total, the corn content is probably greater than the chicken meal (remember that we don’t know the %, only the order of weight). Unlisted preservatives: The pet food maker is only required to disclose on the ingredient list those ingredients and preservatives that they themselves added to the food. Some ingredients – usually fats, and some fish products – have preservatives (usually ethoxyquin) added before they arrive at the pet food factory. You will not see this included on the ingredient list. Note that the use of ethoxyquin to preserve food for humans is strenuously debated as it is thought by some to be carcinogenic. The amount of ethoxyquin allowed in human food is a fraction of that allowed in pet food.